What is an exhaust temperature spread, and why is it so important to monitor and take appropriate action when an exhaust temperature spread develops? An exhaust temperature spread refers to a high differential in readings between the thermocouples placed radially around the exhaust of a gas turbine. The worst exhaust temperature spreads occur when the hottest- and coldest exhaust thermocouple readings are grouped very closely (adjacent). Most exhaust temperature spreads are the result of combustion section problems that can lead (very quickly in some cases) to premature turbine blade (“bucket”) failures. In other words, exhaust temperature spreads are indicative of combustion troubles that can lead to catastrophic failure. Most heavy duty gas turbines employ multiple combustors, called ‘can annular combustors,’ each of which produce high temperature gases that are “funneled” to the first stage nozzles of the turbine section where they are expanded to produce torque. Ideally, each one of these combustors should be receiving equal amounts of fuel and air which should result in relatively uniform hot combustion gas temperatures from each of the combustors entering the first stage turbine nozzles. The turbine buckets rotate past each combustor at very high rates—from 50 times per second for a 3000 RPM machine, to as many as 85 times per second for a 5100 RPM machine. there is too much stratification of the gases flowing into first stage turbine nozzle making it impossible for one sensor to adequately sense the temperatures under all conditions. So, how are these combustion problems detected by the exhaust thermocouples? It also surprises most people to learn that as hot combustion gases flow through the turbine stages there is very little mixing. 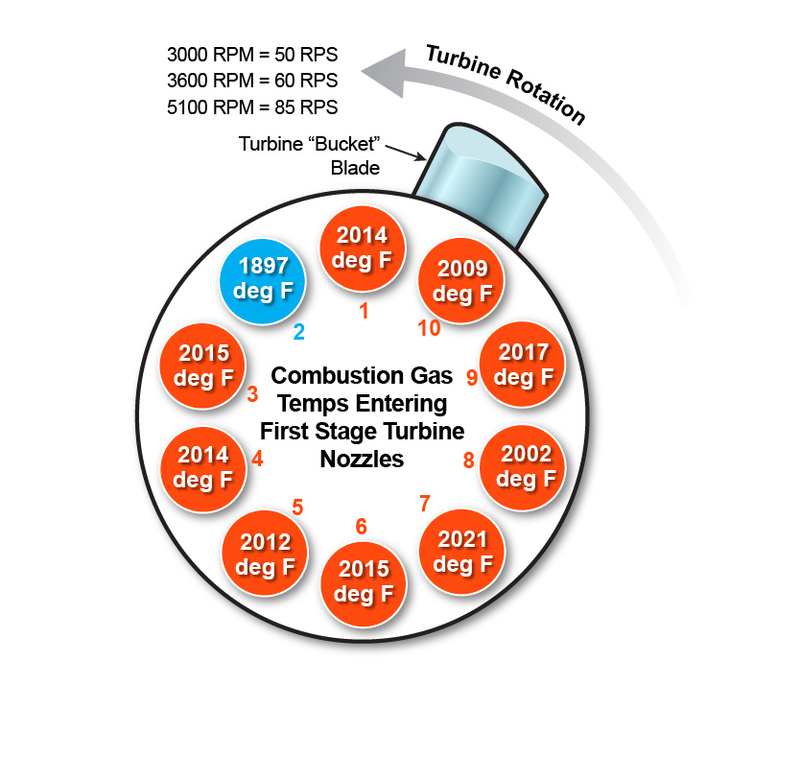 Hot combustion gases from a combustor don’t travel axially straight through the turbine section (a phenomenon known as “swirl”), but they mix very little with the gases from adjacent combustors before they enter the gas turbine exhaust. 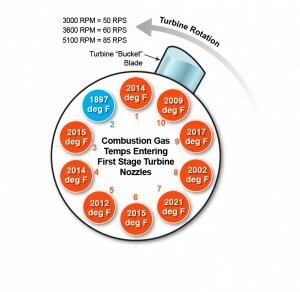 It’s this fact (that very little mixing occurs as the hot gases pass through the turbine section) that allows the exhaust temperature thermocouples to be used to sense cold or hot spots in the gas turbine exhaust which are indicative of unequal fuel- and or air flows into individual combustors. So, what causes most exhaust temperature spreads? Far and away, most exhaust temperature spreads are the result of mechanical issues. Plugged fuel nozzle orifices, enlarged fuel nozzle orifices and fuel nozzle assembly problems (loose components; worn components) are the most common causes of unequal fuel flow-rates. On liquid fuel-fired machines, liquid fuel flow divider issues can cause unequal fuel flow-rates, as can leaking liquid fuel purge air check valves. Failed liquid fuel check valves can also cause incomplete combustion and high exhaust temperature spreads. Severe problems can even result in loss of flame in one or more combustors (combustors with or without flame detectors) which can cause very high exhaust temperature spreads/trips. Low, high or uneven atomizing air flows can result in incomplete combustion and even loss of flame. Primary zone re-ignition or flashbacks in DLN combustors can cause high exhaust temperature spreads. Cracked or broken combustion liners or transition pieces, hula seal problems, and leaking transition piece side seals can result in high exhaust temperature spreads. Some exhaust temperature spreads have been caused by insulation found to be blocking the air flow across the thermocouple. Improperly inserted- or terminated exhaust thermocouples can cause high exhaust temperature spreads immediately after a maintenance outage. Finally, failed, failing or intermittent exhaust thermocouples can cause false exhaust temperature spreads and even trips. While commonly suspected at the first hint of exhaust temperature spread problems on running units, instrumentation problems are not usually to blame for exhaust temperature spreads unless wiring is damaged by heat or other causes. One way to quickly eliminate instrumentation issues is to change load appreciably. If the highest and/or lowest exhaust thermocouple readings do not move with load changes—meaning the position of the coldest (or hottest) exhaust thermocouple will change (“move”)—the cause may be attributed to failed or intermittent instrumentation. As was mentioned before, due to the swirl phenomenon a true exhaust temperature spread will appear to move (rotate; change position) as load changes; if the problem is one or two failed or failing exhaust thermocouples the position of the hottest/coldest thermocouple will not change with load.